Welcome to the Emerald City. Our award-winning sustainability efforts are a testament to Seattle's national green leadership. 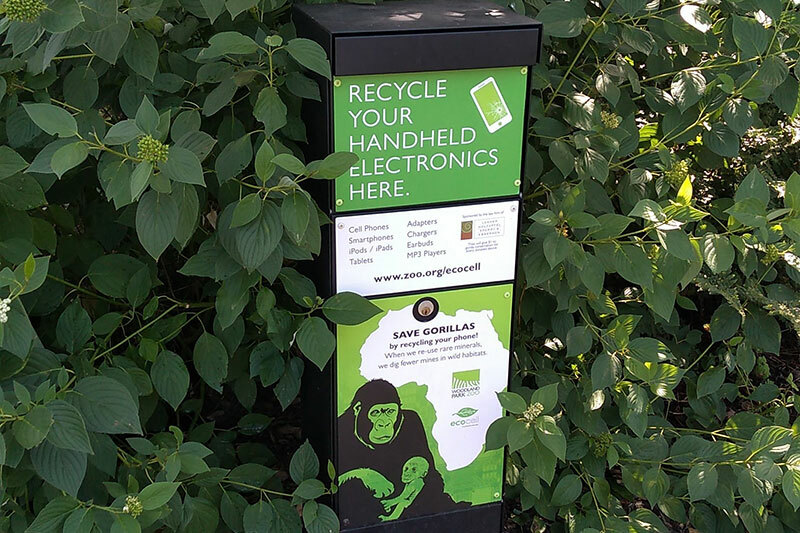 Recycle your old cell phones and handheld devices to help save gorillas! Woodland Park Zoo is proud to partner with ECO-CELL to collect and recycle e-waste. This helps reduce the demand for Coltan, an ore used in phones and other electronic devices. Coltan mines in the Democratic Republic of the Congo destroy habitat critical for the survival of endangered species, including the western lowland gorilla. Bring your used handheld electronics to the zoo for recycling! We accept cell phones, MP3 players, handheld games, e-readers, digital still and video cameras, GPS, portable hard drives and more. Use the drop-off boxes, pictured here, are available for collection of items at both the South and West zoo entrances. ECO-CELL recycles all items we receive using the best technologies for recycling e-waste. Our Green Team works with every department across the zoo to influence and advocate for sustainability practices on zoo grounds and beyond, in collaboration with our partners. Woodland Park Zoo is home to one of the longest standing Green Teams in the industry. Founded in 2001 with a mission to focus on water and energy conservation, our Green Team is a multi-disciplinary group of zoo employees who pursue, promote, and encourage sustainable daily practices at and beyond the zoo. We work closely with our Education, Interpretive and Communications staff to drive both internal and external conservation action and behavioral change. 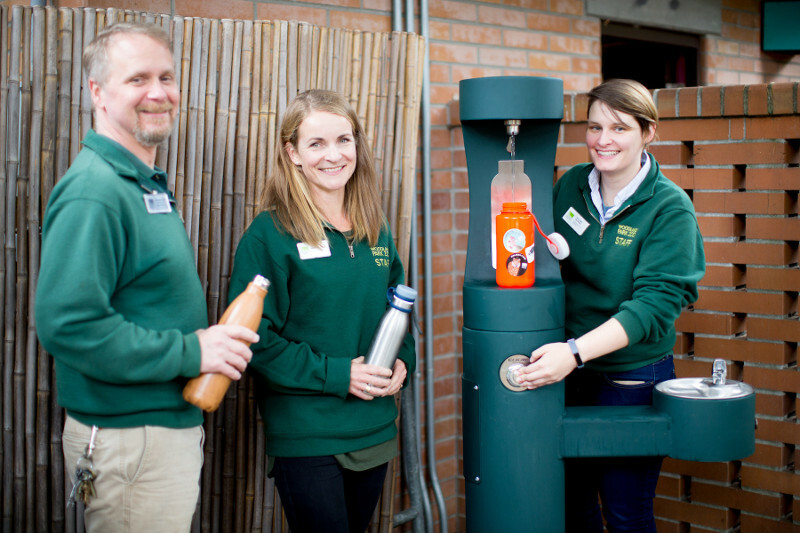 A recent example is the phasing out of single use plastic bottles at the zoo. Woodland Park Zoo was a founding member of EnviroStars, a King County initiative supporting organizations in reducing hazardous materials and waste in order to protect public health, municipal systems and the environment. In 2017, we renewed our certification under the expanded EnviroStars program. As an EnviroStars “Champion”, the zoo is recognized for taking sustainable actions through saving energy and water, reducing waste and pollution, choosing safer products and cutting greenhouse gas emissions. As the region’s premier zoo and aligned with Seattle’s Climate Action Plan goals, we aspire to become our community’s living showcase of sustainability. Our Sustainable Zoo Plan provides a roadmap for preserving and enhancing natural resources that sustain wildlife and the human economy. Our progress is thanks to our public partners, King County voters and the Seattle Park District investment, passionate staff, and committed volunteers and guests.